Live Nation Urban and TCG Entertainment recently announced a series of A Night of Symphonic Hip Hop, featuring Wyclef Jean. The series kicks off in Omaha, NE on January 19th at the Holland Performing Arts Center backed by the Omaha Symphony, and then heads to Columbus, Ohio on February 17th backed by the Columbus Symphony at the Ohio Theater, followed by an evening in St Louis, MO on March 9th backed by the St. Louis Symphony Orchestra at the Powell Hall, and finally a performance in Dallas, TX on May 2nd at Winspear Open House with the Dallas POPS. Additionally, a show in Jacksonville, FL is to be announced. Tickets for the initial four dates are on sale now and available at the links below. Following its introduction earlier this year, “A Night Of Symphonic Hip Hop,” presented by Live Nation Urban and TCG Entertainment, has unified some of rap’s most celebrated icons—Common and The Roots—with full orchestras for an experience unlike anything in the marketplace. This next incarnation of “A Night Of Symphonic Hip Hop” places worldwide superstar and three-time hip-hop Grammy Award-winner Wyclef Jean, on stage with three symphonic orchestras. 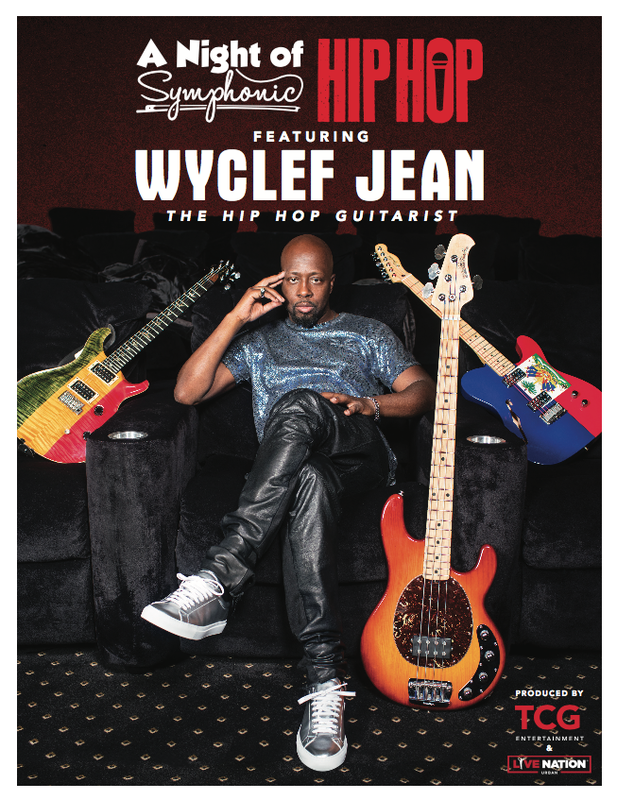 Over his long career, Wyclef has blended the lines of Hip Hop with other musical styles and for the first time, the “hip-hop guitarist” will perform LIVE with a full symphony orchestra, the events promise to be unforgettable for classical music aficionados and hip-hop heads alike. Wyclef will be playing a mix of new favorites like, “What Happened to Love” and “Borrowed Time” as well as his classic hits. The transformative nature of “A Night Of Symphonic Hip Hop” continues to speak to audiences across genres. Launched with performance by Common, the concert series has sold out consecutively and drawn crowds comprised of rap and classical faithful, presenting a powerful cross-section of audiences.